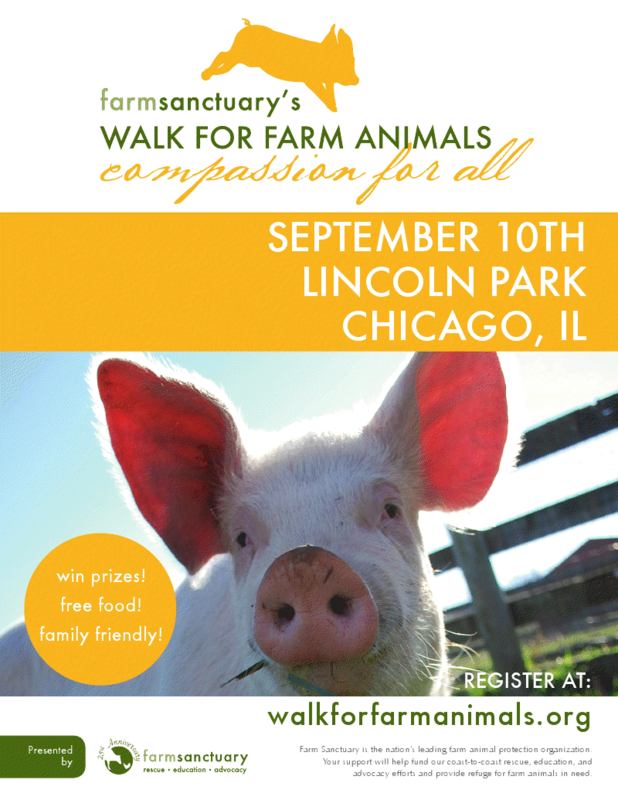 Join Farm Sanctuary for their Walk for Farm Animals in Lincoln Park on Saturday, September 10th, 2011. The Walk for Farm Animals is a series of annual fundraising and outreach events to prevent cruelty towards farm animals and promote compassion for all. Chicago’s 2.75 mile Walk for Animals will take place at Lincoln Park’s Grove 13 (300 W. Wellington Ave., Chicago, IL) at 10 am (check-in begins at 8:30 am) and will be followed by a celebration at 11 am featuring music, food, raffle prizes and guest speaker, Gene Baur, Farm Sanctuary’s President and Co-Founder!